Cancelling within less than 48 hrs before arrival date will result in the charge that equals the deposit amount, or amount of the first night (which is usually the amount of the deposit). Food FULL BOARD available, as well as lunch packets for large groups (take out). No drunk, loud and rowdy groups. We kindly ask that you check your e-mail after booking, as we will be reaching out with an inquiry for your arrival time. This is important, as we do not offer a 24-hour reception out of season (1.10 - 1.4) . Our afternoon receptionist is at the hostel until midnight (24:00). *** Bookings after September 10 *** ALL check-ins are on an Appointment-only basis Please check your e-mail and kindly reply with an approximate time of arrival, or check-in will not be available at the time of your choosing. We cannot check anyone in after midnight, even in the event of transportation delays. Thank you for understanding. 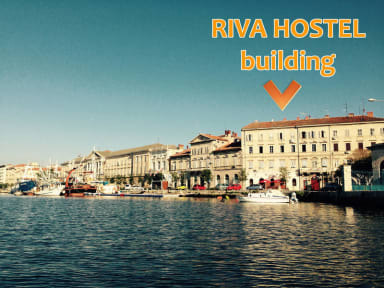 Welcome to Riva Hostel, an extension of one of the top-rated hostels in Croatia! Featuring 9 x Seaview rooms -- facing the Adriatic Sea and fishing boats, 20m away from your window! Located in the heart of Pula's center and at the famous Pula waterfront (Riva), we are steps away from the historic Forum and Kandlerova Street, which boasts some of the most impressive Roman architecture in Croatia, as well as a variety of cafes, bars, and shops. 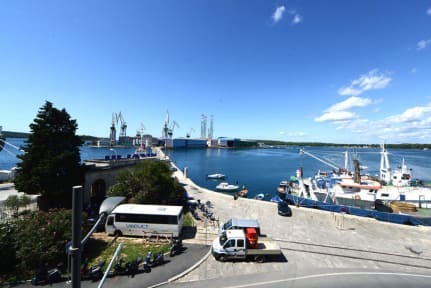 Pula's breathtaking Amphitheatre ('Arena') is a mere five-minute walk from Riva Hostel, and all of Pula's main attractions are within walking distance. Tucked inside a quiet Austro-Hungarian courtyard building, our comfy space consists of many large and spacious sleeping rooms with sea views, a large rooftop terrace with lounge chairs and a bar - great meeting point for our guests! In addition, we offer hi-speed WIFI throughout the property. Each room in our hostel has tall ceilings, which makes sleeping with more people in the room comfortable! Each room has its own A/C unit. Some rooms have their own newly renovated bathrooms, with spacious shower stalls inside the room, while the rest of the hostel uses a common shower area. In all, there are 15 toilets and 11 showers available at any time! All kitchen appliances and utensils are available for cooking and preparing anything from simple meals to large-scale lunches and dinners for group bookings. Our staff is energetic and highly dedicated to the needs of each and every guest! It is our firm belief that going this extra mile is what makes a hostel experience above average, and takes at least some of the stress out of traveling and spending time in a foreign country. We want you to feel at home in our hostel. We are all more than happy to share our experiences, recommend travel ideas, provide useful information, and help you clarify and plan the remainder of your travels. The place to stay if you are in Pula! Staff is so nice, helpful and always trying to make you feel more like home. The location is absolutely perfect, 5 min walk to colosseum, and surrounded by food places. Everything was very clean. They also have a cool rooftop bar. Romano and his staff were excellent hosts. I would come back to Pula just to stay here again. The location is close to the bus station, the colosseum and the old town. The terrace is a nice place to hang out and enjoy a good atmosphere. I would highly recommend this hostel. Everything great except internet. I work online and had a hard time making VOIP phone calls and streaming videos. Hostels need to take this more seriously in 2019 and prioritize internet speed. More and more people work online and need the internet for so many things while traveling, and it's a bad value for money when you have to leave the hostel and go spend money at a cafe or restaurant for hours to use their internet. Other than that, everything else was satisfactory. I went in April. They just had lots of new security lockers delivered. Towel on all the beds. Central location, easy to find. Large rooms. Very good price. +Great location. Quiet backyard with no noise during the night. Helpful staff (the owner was very nice). Seperate bathrooms for each room. Free coffee. -The hostel is a bit run down, for example shower doors were broken, some rusty pipes. No bar. There was no key for the bathroom in our 8-person room. No lockers. Went in off season so atmosphere was as expected. Terrace is a nice place to chill. As others have stated no lock on the bathroom and drainage was not good. A little updating would go a long way for this place. Location is perfect. The hostel is well located, the kitchen is okay. But, the bathrooms were a bit dirty. No staff around for most of the time and they're not too enthusiastic about the city. Okay, it is the "off-season" but there were still a fair few guests around and no staff. Might be better in the summer.